Essentially there are three kinds of catfish: flatheads, channel, and blue. Each has its advocates and detractors, but there seems to be agreement that any catfish caught in cold deep water will taste great. A lot of people complain about a muddy taste in catfish, but it can be totally avoided. If you fillet a blue, you will see mostly white meat, but there is a red streak that goes down the middle. If you cut it out with a really sharp knife, you're left with pristine white meat that is ready for cooking. At this point just about any recipe that works for firm white fish will work here. Let's take a look at a basic fried catfish recipe. 1. In a bowl, sprinkle the filets with one generous tablespoon of Old Bay. Squeeze the juice of half a lemon onto the fish. Use your hands to evenly coat the filets with the seasoning. Cover and refrigerate for at least one hour. 2. To mix the coating batter, combine the corn meal, flour and salt in a bowl, and sprinkle generously with Old Bay. Mix well. 3. Crack the eggs into a separate bowl, toss in a teaspoon of Old Bay and stir vigorously. 4. Dip the chilled filets into the egg mixture, then dredge with the coating batter, making sure to evenly and thoroughly coat both sides. Squeeze a little more lemon juice on the filet. 5. Pre-heat a cast-iron skillet over medium high, and add the 3 cups of oil. When it starts to shimmer, add the catfish filets one at a time. Fry on each side for two minutes. Remove the filets and drain on paper towels. Serve within 10 minutes. Other recipe ideas include blue catfish tacos, blue catfish bouillabaisse, and simple baked blue catfish with a lemony beure blanc sauce. 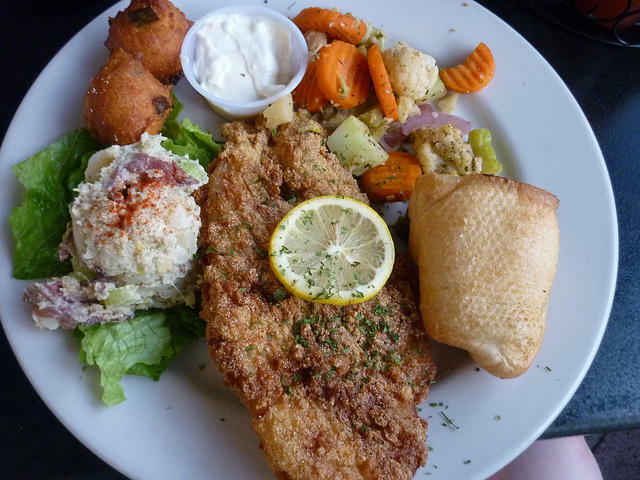 And our friend John Shields has used blue catfish in a delicious fish and chips dish. For more information on the recipe contest, or general inquiries about Maryland's Best Seafood, contact Ron Buckhalt ron.buckhalt@maryland.gov or call 410-841-5838. If you'd like to enter your recipe on line, fill out this form. Or you can send them to Seafood Marketing, MDA, 50 Harry S. Truman Parkway, Annapolis, MD, 21401.